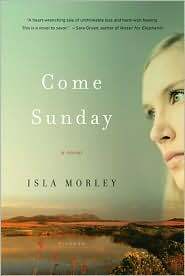 Come Sunday is a story that explores the tragic devastation of a couple after their small child is accidentally killed. A seemingly matched pair, the two choose alternating paths to recover from their daughter Cleo's death. No one is free from the tragic ripples that spread out in the days after the accident. First, the novel alternates by showing the coping mechanisms of the husband Greg, a pastor in a small church, who dives into his work to find meaning in Cleo's death. At the same time, Cleo's mother Abbe handles her grief in a more withdrawn way: her crisis in faith is mixed with the crisis in friendship, and the blame she needs to bestow in order to cope. Strangely, the events lead her to recollect the abuse she and her brother had suffered in their childhood home in South Africa...memories she had long avoided. The death becomes the watershed of all the emotions she held in check for so many years, and creates a turning point for her. At times, her mourning is complicated between grief for her daughter and for herself. The different rituals and superstition that were present in South Africa, especially in view of bad omens, are at times fascinating. And yet they remain incapable of either preventing harm or in helping someone cope. In many cases, what they consider a bad omen is simply hindsight trying to find a meaning for the inexplicable. I really wanted to say I liked this story...it was complex and relevant, after all. My only complaint was in the character of Abbe...the main character of the novel. Her behavior both before and after Cleo's death didn't seem realistic. At times she's described as falling apart, but her actions seem more purposeful than someone who is insane with grief. Her tone in different conversations appears off somehow, almost emotionless, and there's no other details that would reveal her emotionless state is part of the grief process. The husband Greg seemed too accepting of the loss. The disintegration of their marriage is easy to see coming. The most fascinating character to me was of Cleo's uncle, Rhiann, who felt more emotionally real. All said, it's a fascinating glimpse at both Hawaii and South Africa, and the complex course that emotional recovery takes. Special thanks to Diane Saarinen for the Advance Review Copy. 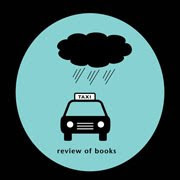 I'm not sure this book is one I would pick up, but thank you for the review!